Holley NY to Niagara-on-the-Lake Ontario. 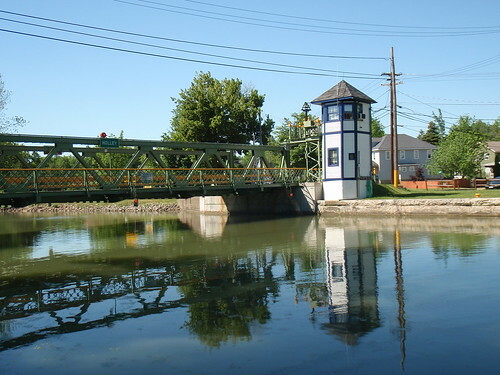 The Holley drawbridge and tower. We camped to the right of the tower. I start my mornings with a level of nervousness that I don’t completely understand. I’m afraid that I won’t be comfortable on the bike, or that I won’t be able to ride as far as we have planned for the day. I’m afraid we have set a target that is beyond what I could reach, and if we fail it is because I am not strong enough. Today was a really long day. We wanted to make a run for the border, and by lunch it wasn’t clear we had any chance of making it. We were slogging along the Erie Canal trail at approximately 12 km / hr. Both a strong headwind and the chipped stone surface of the pathways were slowing us down. We had a long way to go and the daylight hours were limited. I did not want to be attempting a border crossing in the dark! Becky’s view when there is a headwind. After lunch things improved dramatically. The headwind stopped and we gained a fair bit of strength. Our average jumped up to over 15 km / hr, even when I was leading. Before lunch, to get to 12 km / hr Scott had to lead and I would follow in his draft. Without him breaking the wind, I would only make 10 km / hr! So, after lunch it was delightful to speed along the canal path. Scott at the northern most point of the Erie Canal path. Guard gates on the Erie Canal. Note the arrows to tell boaters where to go! We reached the end of the canal path at 5 pm (Lockport). We had 30+ km to go to the campground on the Canadian side of the boarder. At 15 km / hr this is over 2 hours, but that doesn’t include stops. We stop every 45 – 60 minutes for bio breaks and to stretch out our legs; otherwise our feet fall asleep and our legs get really unhappy with us when we get out of the bikes. At the top of the locks in Lockport, Scott stopped to chat with a lady. Unfortunately, that chatting went on longer than I would have liked, since I was watching the clock and wondering if we could make it to the border on time, plus I needed to get something to drink (with sugar) to sustain me. By 5:30 pm we were on our way out of Lockport. We picked up the pace to an average of 20 km / hr (no headwinds and mostly flat). Becky climbing the steep hill at the locks in Lockport. We reached Lewisville at 7:45, but then made a few wrong turns. If we had just followed the “to Canada” sign, we would have been OK. Unfortunately, the sign was followed by a sign for the I-190, so I thought the onramp led to a major highway, and not straight to the bridge. We were searching for the back road to the bridge. Eventually, we found our way back to the “to Canada” sign and followed it. It turned out to take us directly to the bridge and Canadian Customs. We had no issues clearing customs and didn’t need to pay for the bridge (the toll to cross is collected after crossing, and the toll booths lead directly to the QEW – major highway). The nice toll booth person sent us around back of the toll building and into the employee parking lot. From there, we could get directly onto the Niagara river parkway, and pop down into Niagara-on-the-Lake. We pulled into the campsite at 8:30 pm. We were able to pick up a couple of things from the camp store, so dinner was quick (canned corn, canned yellow beans, and textured vegetable protein with some spices). We had originally thought we might spend two nights at the camp ground in Niagara-on-the-Lake, but it turned out to be a pretty mediocre campground. I was especially disappointed with the locked shower/bathroom building and the need to pay for showers. When you pay $30 per night to camp, you should at least get a free hot shower! The tent sites were just spaces in an open field with a few trees. There was no privacy with sites and the picnic tables were old and chinsy. Since the facilities didn’t add up to a peaceful rest day we decided we would just take it easy tomorrow, but move on to someplace else.